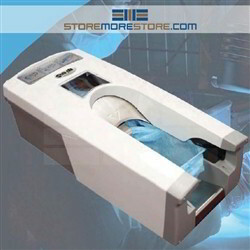 The automatic shoe cover dispensers for disposable booties are an easy way to increase efficiency in your hospital, manufacturing, food processing, and other small, medium, and high-volume applications that require cleanliness. Automatic shoe cover dispensers are available in two configurations depending on the size of your application. The larger, ideal for medium to high-volume uses, comes with a stainless steel handlebar for added safety and holds up to 220 shoe covers (two bundles). Both options provide the same hassle-free ease of use. Whichever one you choose, both dispensers provide a non-electric, hands-free, and portable solution that allows users to slide their shoe covers on quickly. While manually putting on booties may not seem time-consuming, the minutes add up. In manual processes, each person has to retrieve a pair, sit down, and put them on. With the dispensers, users simply rest the ball of their foot on the metal plate and pull back in one continuous motion. In fact, the dispensers allow users to put their shoe covers on about four times faster than manual methods. The assistance of the safety handlebar is also great for users with limited mobility. Disposable shoe covers are also available to buy online to load into the dispensers. The shoe covers are available in a variety of package sizes and materials, such as waterproof and non-skid. 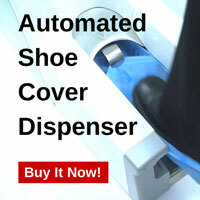 We have automatic shoe cover dispensers available with the best prices to buy online. For further assistance, call us at 1-855-786-7667 or send us a message to speak to one of our experts. Shoe Inn Portable Bootie Dispensers – Cheaper Than Amazon! 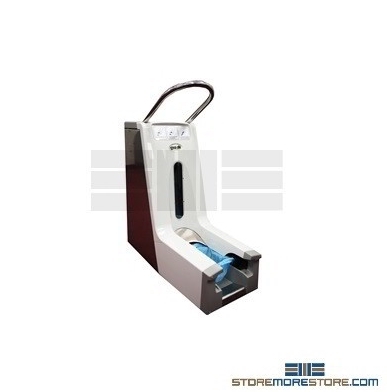 StoreMoreStore currently has a special deal for Shoe Inn Portable Bootie Dispensers! It’s a deal so good – it’s better than the price on Amazon. And you get free shipping from us! This makes it a great time to purchase your Shoe Inn Portable Bootie Dispensers. What is a Shoe Inn Portable Bootie Dispenser? 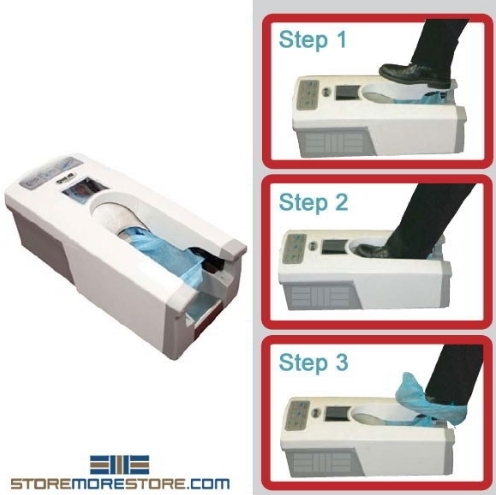 If you’re not sure what a Shoe Inn Portable Bootie Dispenser is, watch the video below. Basically, it’s a portable machine that holds shoe covers and puts them on for you. The dispenser is extremely easy to use; you just rest the ball of your foot in the metal plate, pull back in one continuous motion, and you’re done. The shoe cover is now on your foot and ready to go. Take it anywhere: Because the dispenser is portable, you can take it anywhere you want. This is a huge advantage for real-estate agents, construction workers, and pretty much anyone that needs their shoes covered while on the job. Save your time: Using the Shoe Inn Bootie Dispenser is 4 times faster than manually putting on shoe covers. All that saved time translates into higher efficiency and better productivity. Prevent injuries: Bending over to put on shoe covers – especially while standing – puts people at risk for injuries. With the Shoe Inn Bootie Dispenser, you won’t have to do that anymore, and any time you can create a safer environment you’ve done right by your employees. No electricity needed: The dispenser doesn’t need to be plugged in to work, making it ideal for construction sites with no electricity. This great deal on Shoe Inn Portable Bootie Dispensers won’t last forever, so shop now to take advantage of the low price and free shipping! If you need any help or have any questions, give us a call at 1-855-786-7667.